Storm Aviation is a reputable approved EASA Part-147 (approval number UK.147.0057) Maintenance Training Organisation (MTO), providing aircraft engineering training in the B1.1 Aeroplanes Turbine and B2 Avionics categories. Engineers come to us throughout their careers, to gain the necessary qualifications and knowledge needed to maintain large commercial air transport (Group 1) aircraft which includes types such as the A380-800. Storm Aviation Training Suite, this year will be delivering A320 CEO (V2500 & CFM56) and A380-800 (RR Trent 900 & EA GP7200) training to a mixture of internal and external staff, with practical training delivered in the UK at Newcastle International (NCL) and in Thailand at Suvarnabhumi Airport (BKK). Our Training Suite comprises 22 individual computer stations, all linked to the latest revision of AirN@v and the other necessary documents to ensure today’s electronically active maintenance engineer is ‘out-of-the-box’ ready to maintain the latest generation of aircraft. These include; MEL/MMEL, FCOM, AMM, TSM, FIM, IPC, PIPC. All of our courses will be both theory and practical and include differences elements. By segmenting our courses and clearly defining the sections between B1.1 and B2, we allow engineers to sit only the regulatory necessary phases, thus saving time and money. 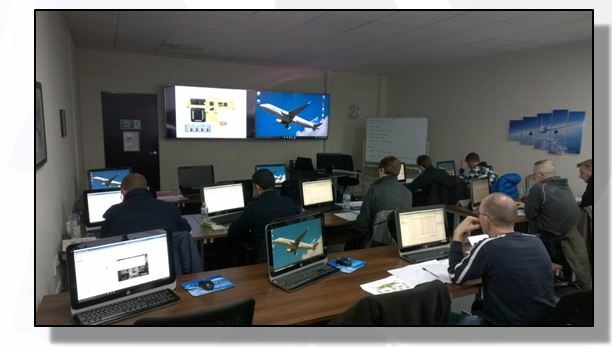 Last year we have delivered B737 NG (CFM56) B1/2 and A320 CEO (V2500 & CFM56) B1/2 in Antalya, Turkey (AYT), and other non-147 courses have included the Foundation of Instructional Techniques and IOSH (Institution of Occupational Safety and Health). We have also carried out a ERJ 170/190 Theory course in Norwich. Unlike many other training organisations, Storm Aviation provides immediate and extensive access to aircraft through our EASA Part-145 MRO. This means we do not need to pre-arrange aircraft access, resulting in added flexibility for your training schedule. Providing the best possible training is at the core of our work, so we constantly strive to upgrade our training capabilities. Storm aims to deliver convenience as well as quality, by offering theory, practical and on the job training under one roof. We also provide general training courses developed in-house, such as Fuel Tank Safety and EWIS. Our highly experienced trainers can come to you, or your staff can visit Storm Aviation’s own site in Stansted, UK. We provide training anywhere around the world at our customers’ sites. If EASA Part-147 training is required, we can gain the necessary CAA remote site approval to allow any suitable venue to become appropriately approved. Storm is working closely with Kingston College and Newcastle Aviation Academy to provide trainees with opportunities to develop key aircraft engineering skills for the future. They gain maintenance experience at our line stations, on some of the most popular and cutting edge aircraft. We also run Structured On the Job Training (SOJT) programmes, a requirement of Part-66 for first type endorsement, on the A320 family (CFM56). As active members of the aviation community, Storm Aviation is happy to discuss all of your maintenance training requirements. For more details or information on EASA Part-145, Part-M, Part-147 or Part-66 training matters, contact Storm Aviation’s Training Manager, Benjamin Greenaway or Keeley O’Donegan, Business Support Associate: call +44 (0)1279 681330 or email training@stormaviation.com. For information on Benjamin’s credentials and background see his biography.